In most cases, feline sneezing is a result of your cat’s respiratory system functioning properly. However, your cat may possibly be sick if he starts to sneeze a lot. 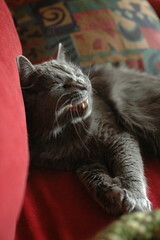 There are various things that can cause an episode of feline sneezing. Let’s take a look at some of the most common causes. An upper respiratory infection is one of the most common causes of feline sneezing. Infections that cause sneezing episodes are usually caused by the Adenovirus or the Parainfluenza virus. These viruses are highly contagious and can easily infect your cat after he comes into contact with other animals. The infections produce other symptoms besides sneezing such as swollen glands, coughing, and mucus discharge.